Whether saving desperate survivors from a sinking ship or flying into the teeth of storms to search for drowning sailors, the work of a search and rescue pilot is vital, dangerous, thrilling and also on the edge. Jerry Grayson is the most decorated search and rescue pilot in history. This is his story. Jerry Grayson is an ordinary man who chose an extraordinary career. At age 17 he became the youngest helicopter pilot to ever serve in the Royal Navy. By age 25 he was the most decorated peacetime naval pilot in history. For the Navy's Search and Rescue pilots, getting to work is both an adventure and an ordeal. 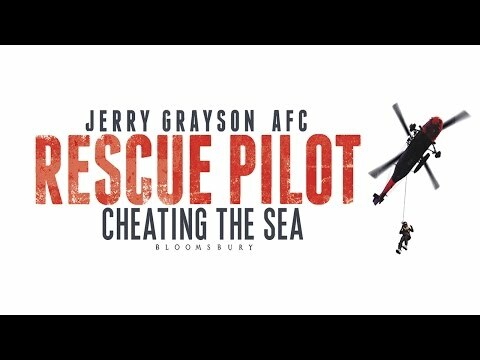 Whether rescuing a wounded fighter pilot who has ditched in the sea, saving desperate survivors from a sinking ship, or picking up a grievously ill crewman from the deck of a nuclear-armed submarine that is playing a cat-and-mouse game with the Soviet navy, Jerry Grayson has lived a life of unparalleled excitement and adventure. His finest hour came during the infamous Fastnet Yacht Race of 1979 in which 25 yachts were lost. When a catastrophic storm enveloped the competitors he and his crew pushed their Sea King helicopter to its absolute limits and put their own lives at risk, flying into hurricane-force winds to winch shipwrecked sailors from heaving tempestuous seas. An investiture at Buckingham Palace with Her Majesty the Queen was the result. Being a Rescue Pilot is a fast-paced career because there is no choice. Lives are at stake and pilots must move and think fast. Jerry Grayson's inside view of this heroic service is as inspirational as it is celebratory. Excitingly told, frequently funny but also very poignant, Jerry's story is not an account of just one man's deeds, it is a salute to all the men and women he worked with who were able to turn tragedies into triumphs. Jerry Grayson served in the Royal Navy's Fleet Air Arm for 8 years, in the course of which he was presented with the Air Force Cross by the Queen for outstanding gallantry in search and rescue. Since leaving the Navy he has become one of the film industry's leading helicopter pilots, designing and shooting aerial action sequences for James Bond films as well as hundreds of commercials and footage for documentaries. He now lives in Australia. Gives a great insight into a little known area of service life. A must read for all who are current, former or prospective service people and their families.